At least one Metro train was off-loaded early Friday afternoon after riders reported seeing and smelling smoke in the busy Dupont Circle station. "It smelled terrible," said Andy Jones, a freelance photographer for NBC Washington, who was in the station at the time. "The smoke was visible both inside the train car and in the station. "It had that burning oil smell." The smoky conditions were caused by a train with a brake problem, said Metro spokeswoman Caroline Laurin. She said the train was taken out of service and there were no reported injuries. 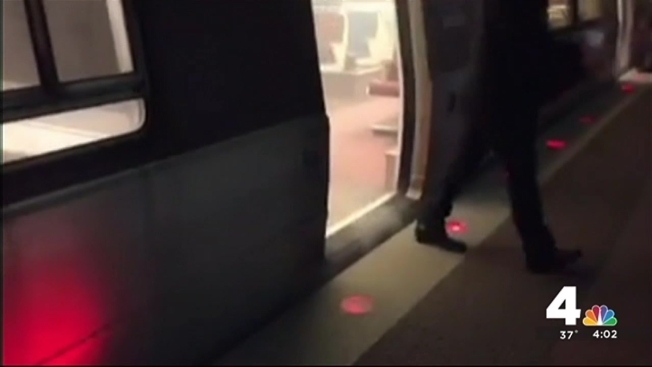 According to reports on Twitter, passengers were covering their faces inside the station. By at least one account, the smoke was "acrid." "DuPont Circle station filled with smoke," Kevin Jones (@vcsjones) posted on Twitter at about 12:40 p.m. Friday. "Train went out of service. Smell is acrid." Andy Jones said that he briefly boarded a train about 12:50 p.m., but it didn't leave the station. "...[W]hen the train pulled up; it smelled really bad and there was a little bit of smoke," he Jones said. "Everybody got on and they told everybody to get off." Jones said the train operator told riders that the train was out of service and they should leave the station. "I don't know if the other train [on the opposite track] stopped," he said. "The whole station was filling up with smoke." Firefighters were called to the Dupont Circle station and stopped people from entering the station for a brief time. Jones said trains may have continued to arrive at the station, though. "About 10 minutes later, a bunch of people came out, so I don't know if they were still dropping people off," he said. Jones said the process was calm. "It was very calm," he said. "Ten or 15 people stopped to take pictures." Metro's Twitter account @metrorailinfo posted about 40 minutes after Jones said he was told to get off the train. In its first tweet about the incident, the transit agency said riders should expect residual delays in both directions "due to [an] earlier fire department investigation at Dupont Circle." It later said that normal service had resumed around 2:25 p.m. The report of smoke came about three weeks after an arcing insulator filled a Yellow Line tunnel with thick, black smoke, causing the death of an Alexandria woman. Nearly 70 other people were taken to local hospitals.